Bengaluru: An audio clip which claimed to be a conversation between Chetan Gowda, the son of Mandya MP LR Shivaramegowda, and former JD(S) leader P Ramesh has gone viral in Karnataka. The clip claimed that the JD(S) is spending Rs 150 crore to ensure chief minister HD Kumaraswamy's son Nikhil’s win in the Mandya Lok Sabha poll. As the audio clip went viral, Suvarna News contacted both Chetan and Ramesh and the duo denied speaking to each other. Chetan said that it was not his voice and Ramesh said he had no clue about which audio the media was questioning him about. 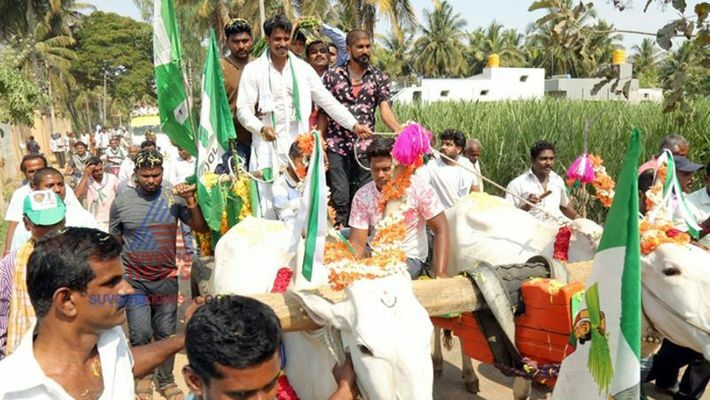 According to the audio clip, it is alleged that the JD(S) has kept aside Rs 150 crore (Rs 5 lakh per booth) and a grand mutton feast for the party workers and people to ensure victory for Nikhil. Nikhil is contesting on a JD(S) ticket against independent candidate Sumalatha Ambareesh who is supported by the BJP. MP Shivaramegowda also said that it was not his son's voice and someone who wants to spoil his image in Mandya was spreading rumours. Chetan said it was a fake audio and his voice was dubbed by someone. The audio conversation claimed how the JD(S) is all set to lose in Mandya and how the party is trying everything to turn it around. When asked by the media, Chetan said at least 40 check points were set up in Mandya. The Income Tax Department and Enforcement Directorate (ED) are active in Mandya. So, how can the money be distributed, he questioned. Shivaramegowda told the media that he may hold a press conference on the issue. But, Chetan said that they have just three more days for campaigning (as Mandya goes for election on April 18) and is already speaking to the media in this regard, hinting that he is not thinking of any legal action against those who made the audio clip. He was also asked if he was hinting at Sumalatha and actors Yash and Darshan who are supporting her. But, Chetan said that this is the work of some low cadre workers and not the actors. Chetan: I am telling you this as I consider you on par with my father. Then don't reveal this to anyone else. Ramesh: Don't worry, there is no one around, tell me. Ramesh: Where will JD(S) win? Chetan: I don't know if JD(S) will win or he (Nikhil Kumaraswamy) will join the Congress. Ramesh: Who is ready to take him. He will be a zero, if he comes. Ramesh: I am telling you, if eight (JDS) MLAs contest again, not even one of them will win. Chetan: Shall I tell you something. The election is a different ballgame altogether. Is Siddaramaiah behind Sumalatha staking claim for Mandya Lok Sabha?